A septic system, also called an onsite wastewater treatment system (OWTS), is made up of a house sewer drain, septic tank, distribution box and soil absorption (leach) field. The house sewer drain collects all the discharge from home fixtures, such as toilets, sinks, showers and laundry and connects to the septic tank. The septic tank collects all the discharges from household plumbing and provides the needed time for wastes to settle or float. The heavy solids settle to the bottom of the tank where they are broken down by bacteria to form sludge. The lighter solids, fats and grease, partially decompose and rise to the surface to form a layer of scum. This process allows the partially treated wastewater to be released to the absorption field. The distribution box evenly distributes wastewater from the septic tank to pipes in the trenches of the absorption field. It is important that each trench receives an equal amount of flow to prevent overloading to one part of the absorption field. Trenches receive partially treated sewage. The absorption (leach) field is a system of trenches and distribution pipes where wastewater is biologically treated by the surrounding soil. The system is partially filled with washed gravel, stone or a gravelless product. The absorption field must be properly sized, constructed and maintained to assure satisfactory operation and long life. The vent permits gases that build up in the plumbing to exit the system. A septic tank should be pumped out every two to three years. A septage waste transporter (septic tank pumper) that is licensed by the New York State Department of Environmental Conservation can inspect, measure tank layers and pump out the tank when necessary. Regularly pump-out your septic tankwhen needed. Keep a record of pumping, inspections, maintenance and repairs. Map out septic tank and other system components. Either have a map or locate components with permanent stakes. This is useful for accessing the system and will prevent damaging system components when doing home maintenance or yard work. Don't park or drive heavy vehicles or equipment over the septic system or any of its components. Don't build structures , such as decks, patios or swimming pools, that would cover the absorption field or limit access to the septic tank and distribution box. Don't flush or use strong chemicals and bacteria-destroying products, such as drain cleaners, solvents, paint, paint thinners, floor cleaners, sink cleaners, motor oil, antifreeze, pesticides, and photo chemicals. These may disrupt septic tank or absorption system operation. Household bleach, disinfectants, cleansers, antibacterial soaps, when used in normal household applications should not affect system operations. Don't flush materials that don't easily degrade, such as paper towels, cotton swabs, personal hygiene products, condoms, medications, disposable diapers, coffee grounds, cat litter, cooking fats/oils, facial tissues, dental floss, cigarette butts, plastics, grease or bones. 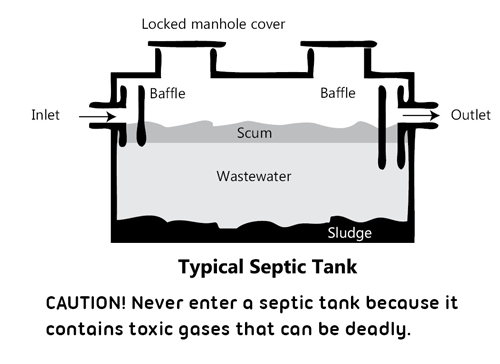 Avoid septic tank additives. A septic tank that is properly sized and maintained will adequately manage household wastewater without the use of additives. Avoid garbage disposals or grinders because these substantially increase the accumulation of solids in the septic tank and in the absorption field. If they are used, the septic tank size should be increased and pumped-out more often. Direct water treatment system discharges to a separate soil absorption system, if possible, to minimize discharges to the septic system. However, as long as the system is well maintained and can accommodate the additional flow, water treatment system discharges can be directed to the septic tank in many cases. Direct drainage away from the septic system from roof, cellar/footing (sump pump) and surface water run-off. Plant grass and other shallow-rooted plants over the absorption field. Keep trees and long-rooted plants and shrubs away from the immediate area of the absorption area. Roots can grow into the pipes and clog the system. Conserve water. Check for defective toilet tank valves, repair leaky fixtures, and install appliances and fixtures that use less water and avoid wasteful practices. Regularly inspect and maintain any effluent pumps and alarms that may be part of your septic system.